Google’s Digital Wellbeing, the app dedicated to weakening the clutches of smartphone addiction has graduated out of beta into the stable version. Digital Wellbeing, which is exclusive to Android Pie devices – specifically Pixels and Android One affiliates, although you can get it on a bunch others too – was silently updated from beta version 0.2 to version 1.0. The update brings slightly updated functionality over the beta version to make its applications more relevant. The most obvious change is within one of the most useful features – Wind Down. Now, the feature will detect if you have an alarm set ahead of the scheduled end of your nightly routine and turn it off automatically if the alarm goes off before the end time. This tiny addition comes in handy every time you have to wake up earlier than usual, and now you need not edit the settings of the Wind Down feature manually. Rest of the features such as Do Not Disturb, Grayscale, Night Light seem to be the same as in beta. On Pixel 3 and 3 XL, you can turn on Do Not Disturb mode by placing the phone on a table with its face downward. The Digital Wellbeing app is Google’s attempt to reduce users’ dependency on their smartphones while features like Night Light and Grayscale aid in falling asleep faster. 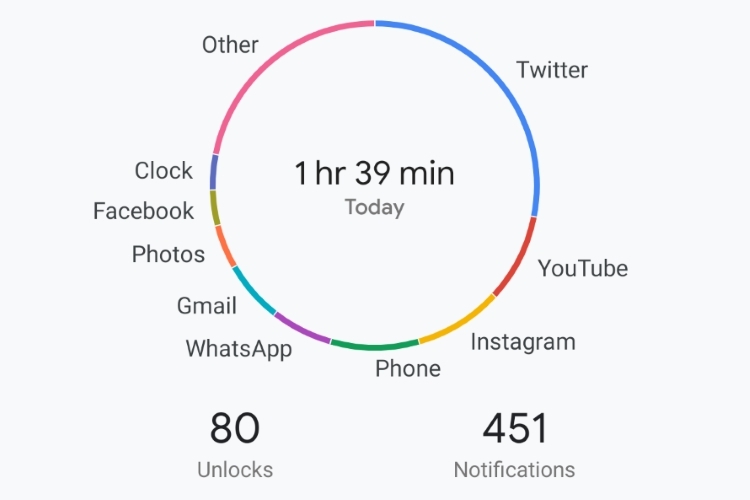 The app also shows users their duration of usage per app, the number of distracting notification from each of them, as well as the number of times an app is opened during the entire day. Part of Digital Wellbeing’s responsibilities also includes noting the number of times the device has been unlocked. There is a slight change in this ticker with the incremental update and it will not count screen unlocks when there’s no screen lock being used. Our Pixel 3 XL automatically updated to the newer version of Digital Wellbeing but the Play Store description still shows an older version. However, if you’re using either an Android One or a Pixel device running at least Android Pie, you can download the latest version of the app by clicking on this link.